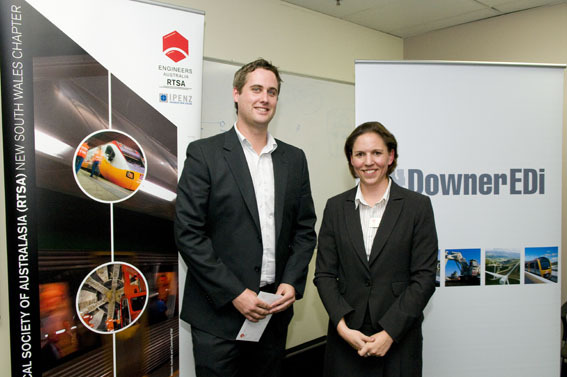 IN 2010 THE YOUNG RAILWAY ENGINEER AWARD HAS BEEN MADE TO TWO AWARDEES, MR. PETER MUNRO AND MR. DANIEL HEADIFEN. Mr. Peter Munro is a Project Manager with Downer EDI Works Rail Project Division in Sydney where presently he is involved with the Port Botany Yard Reconfiguration and Upgrade project for the ARTC. Throughout his career, he has been associated with project management of a variety of significant rail initiatives both in Melbourne and Sydney. He graduated from the University of Melbourne with a Bachelor of Commerce (major in Economics) and a Bachelor of Engineering (Honours) (major in Civil Engineering) and, at present, he is studying for a Master of Science (Railway System Engineering and Integration) from the University of Birmingham in the UK. Mr. Munro is a graduate member of Engineers Australia and has served as a member of the RTSA Victorian Chapter Committee. Mr. Daniel Headifen is a Project and Structural Engineer with Ontrack (Kiwi Rail Network) and acts as member of the Structural Engineering Team, which offers guidance for design standards, gives engineering support for maintenance matters and provides project management services for renewals projects of various magnitudes. Before joining OnTrack, he enjoyed a varying engineering career both in New Zealand and in the UK where he worked for a period of just over three years. He holds a Bachelor of Engineering Degree in Civil Engineering with Honours, from the Canterbury University and is a Chartered Professional/Structural Engineer in New Zealand, a Member of the New Zealand International Engineers Register and a Chartered Member of the Institution of Civil Engineers in the UK.